This watch review is going to be a bit different than how I usually do them. Why? Because shortly before the review I was actually able to visit the manufacture making the movements of this watch. That experience offered me some special insight that allowed me to understand this timepiece more. I know there is a lot of talk on the “manufacture” movement. In fact, a recent panel discussion I had with fellow watch expert journalists allowed me to realize that there is no strict definition of “watch manufacture” or “manufacture movement.” This definitional ambiguity hurts my ability to explain things properly, but let it be said that Montblanc makes the movement in each of the Nicolas Rieussec watches themselves. Of course there is some help from suppliers, but this is about as “in-house” a job as most people want it to be. My understanding is that the components of the movements are made at the Valfleurier facility in Buttes Switzerland. The pieces are then sent to Montblanc Le Locle for assembly and testing. What fascinated me most about the Montblanc manufacture in Le Locle Switzerland was just how modern it was. I mean it is true that many watch manufactures feel like you are in some combo of a hospital and science lab, but the machinery available to the watch makers at the Le Locle facility was impressive. I have a larger feature length article on this topic that will come out soon – but in short, when it comes to the Nicolas Rieussec line of timepieces, Montblanc relies on a clever environment that combines the human approach of watch makers with the precision assistance of machines. A few example of this synergy between man (or woman) and machine? Here are two. One of the images here is of a machine that robotically applies lubricant to designated spots in a watch. Such lubricant must be precisely applied with an exact amount. The more consistently applied the better. While a human assembles the movement, a robot is used to apply the lubricant better and with more precision in terms of amount than any human can do consistently. 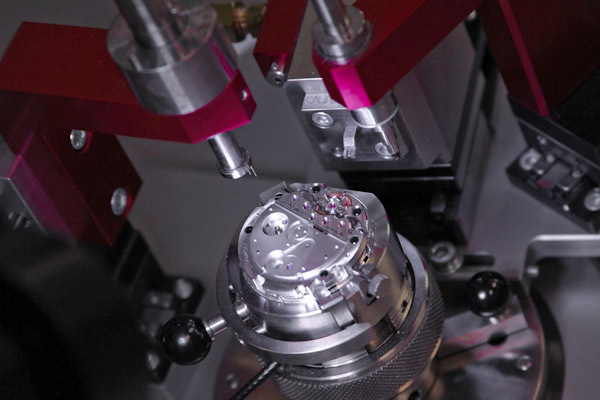 Another example is a machine that allows a watch maker to adjust the screws on a balance wheel and test the accuracy of the rate in real time. Basically the machine combines a magnifier, computer controlled screw driver, and a watch movement rate tester in one. While it is operated by a person, the machine makes it easy to adjust a traditional weighted balance wheel to its most precise weight distribution in the escapement assembly. One of my favorite images here that illustrates the culture of the manufacture is the image of the watch tools with the computer mouse. If you look closely you’ll also notice the presence of a Montblanc pen. 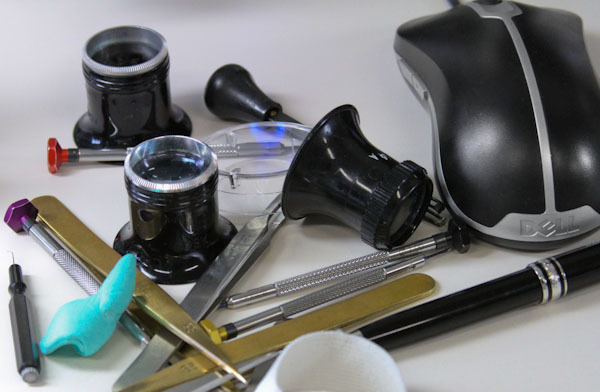 Each work station gives watchmakers a computer terminal as well as watch making tools. While I have seen this before, it certainly isn’t common. With their movements all made in Switzerland by Montblanc, the Nicolas Rieussec collection currently consists of a few watches. My main focus here is on the Automatic Chronograph that also has a GMT and date complication (that I tested). The movement is known as the R200. The two manually wound variants (with slightly different functions) are the R100, R110, and R120 (a limited edition that used a silicium escapement). I am not going to go overboard with technical details, but the movements represent an interesting medium between the ultra-high end, and mass manufactured pieces. The R200 has a lot of impressive features on paper. 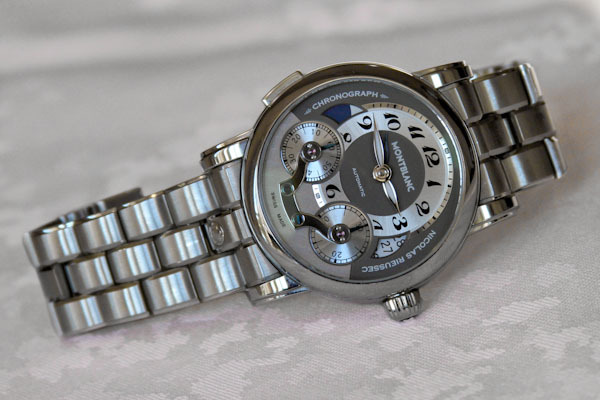 Notable to the watch nerd is that it has a column wheel based chronograph that uses a vertical clutch. These features offer more durability and precision when using the chronograph. There are very few European chronographs that feature both of these features. I should also note that some of Seiko’s higher-end chronograph movements also feature column wheels and vertical clutches, as do pieces by brands such as Patek Philippe and (the former) Daniel Roth. Why all the focus on the chronograph? 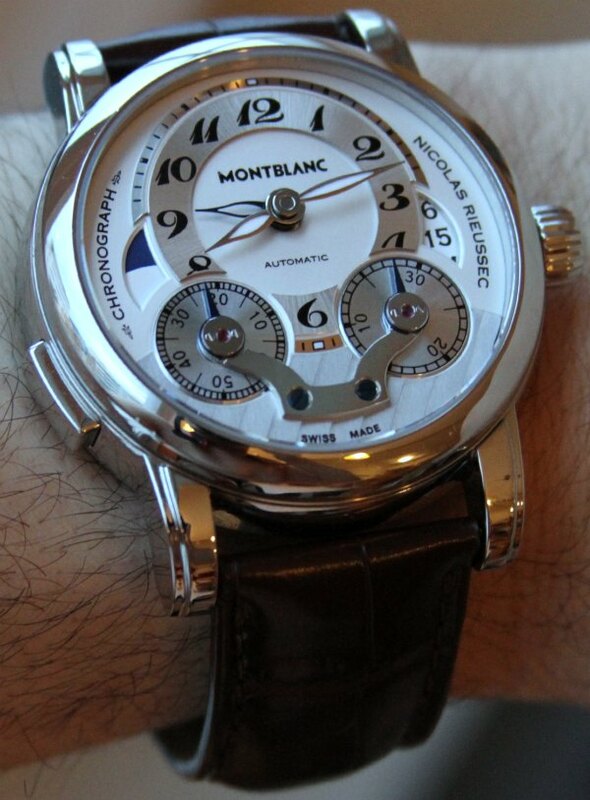 Well that is the new signature complication of Montblanc. The brand latched on to the complication for good reason (as well as to Mr. Nicolas Rieussec). “Chronograph” literally means “time writer.” What is Montblanc known for? Yes, making pens. Sound too good to be true to have a watch in your collection that is a “time writer?” So the emphasis on this complication make perfect sense. Nicolas Rieussec is guy credited with “inventing the chronograph.” Montblanc adopted him. A while ago Rieussec created a device that looks like an early seismograph. It was a clock with a stop and start function that pulled a disc of paper along a smaller writing tip. This device was the first known “chronograph.” It was meant to measure time in horse races and actually “wrote.” The look of the chronograph on the watch is taken from this early device. Montblanc keeps replicas of them around the manufacture for inspiration. Each Nicolas Rieussec watch uses two discs that move along stationary hands to show the chronograph time (up to 30 minutes). These are also monopusher chronographs that use a single pusher to cycle through “start, stop, and reset” functions for the chronograph. The pusher is large, easy to find, and placed at the 5 o’clock position on the watch. Don’t miss the exposed synthetic palette rubies exposed on the top of the chronograph dials. This chronograph style is the signature look of the Nicolas Rieussec collection. The time is displayed on an off-centered dial at the top of the face. While small, Montblanc really helped that dial standout and be legible. It uses that fancy looking font that you’ll find on most Montblanc Star watches. I really do love that font. On the manually-wound versions of the Nicolas Rieussec, the time dial has a third hand used for the date. On the automatic, the third had is GMT hand. Working just like you would assume, the main time hour hand can be independently adjusted to alter the time when moving through time zones when traveling. To the left of the dial is a day/night indicator linked to the GMT hand. This useful complication help you know if it is day or night on your second timezone given that it is displayed on the 12, versus 24 hour scale. Who’d a though this would turn out to be such a useful travel watch? Both time zones share the minute hand. I was generally impressed by the GMT functionality of the watch and feels that the R200 movement’s use of the third hand is better than having it be a date indicator. While the left of the dial has the day/night indicator, the right has a date wheel. 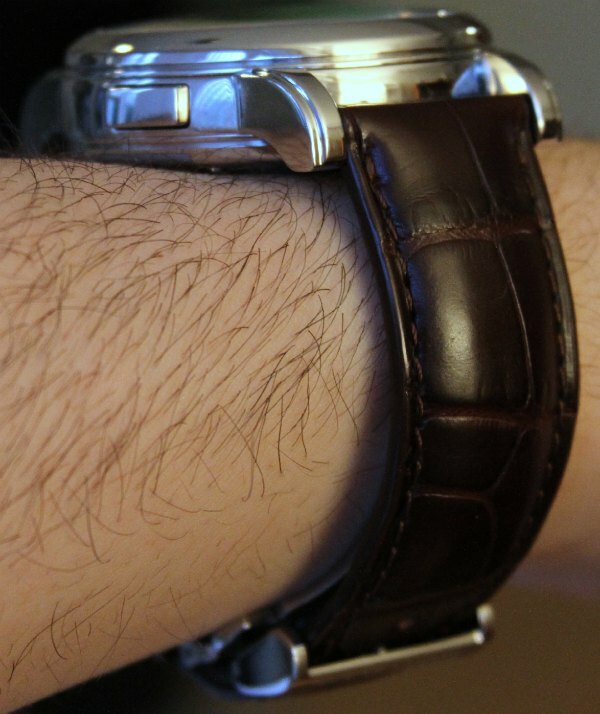 For symmetry Montblanc uses a window of a similar shape, but I don’t much care for “open” date windows. It also does not look spectacular with the upper and lower date being partially under the dial – though that does actually help with keeping your focus on the actual date. While the windows that flank the time dial look nice, I have a feeling Montblanc might work to revise or polish the design in future generations of the watch. 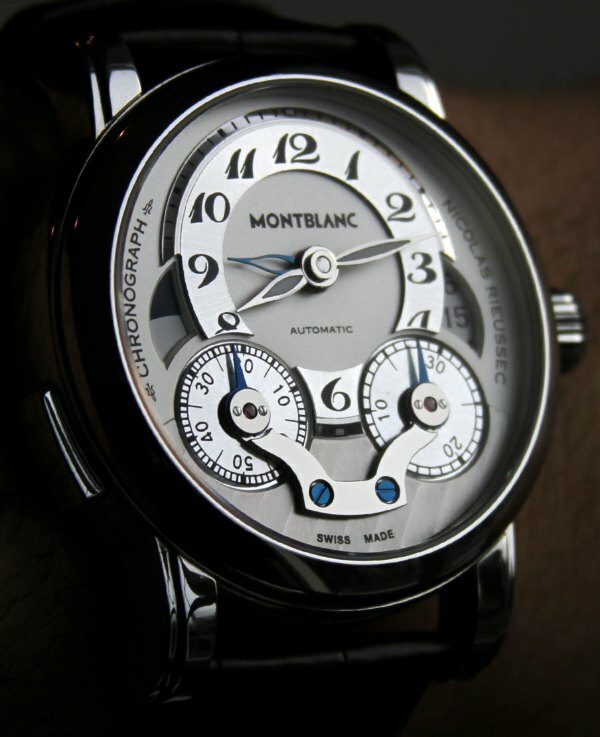 Coming in a few tones, the dial of the Montblanc Nicolas Rieussec is an interesting creature. It took me a while to warm up to it, but I am enjoying the design. While totally different than other collection Montblanc offers, the Nicolas Rieussec does share the brand’s DNA nicely. Of course the crown has that lovely white Montblanc star, and the case is very much inspired by the Star collection. To create visual depth, the power part of the dial is partially “eclipsed” by a plate of Geneva stripe polished metal – plus, the dial looks to be made up of a few layers. The chronograph dials are covered with a sort of wish-bone like bridge that uses blued steel screws (blued steel is also used for some of the hands). This is a nice element, but I had one suggestion for Montblanc. While this might increase the cost a bit, I think it would be really welcome. The bridge is made from stamped steel. What if it could be made from milled and hand-polished steel? It would provide a wonderful visual cue and reminder that this is a hand-assembled watch. Perhaps in the future. Let’s visit the R200 movement again. It is an automatic version of the R100 with a few addition complications (as mentioned above). 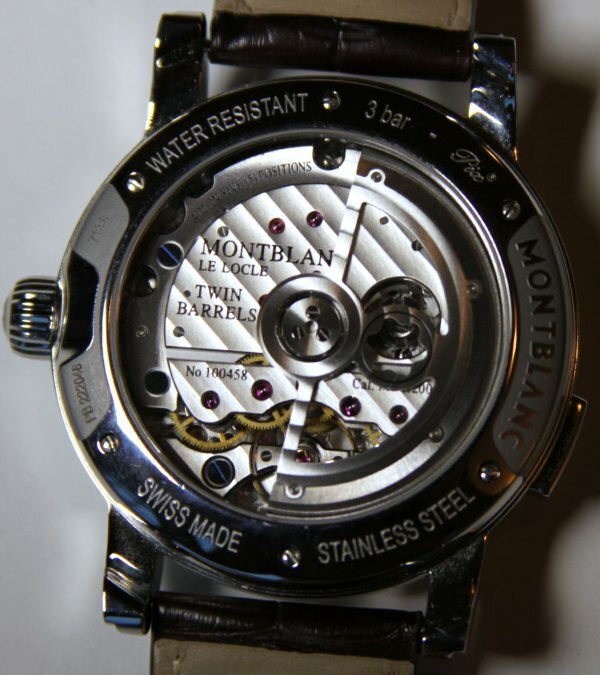 You can see the rotor placed over the movement, with the small Montblanc star shaped hole that is designed to pass right over the column wheel opening window. 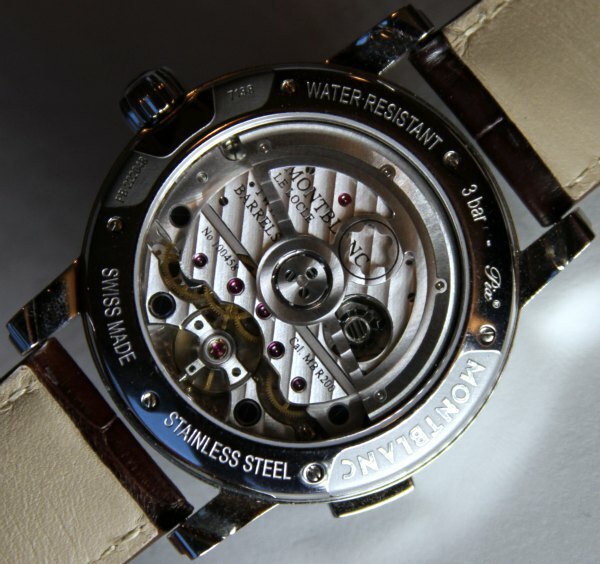 The movement has two mainspring barrels for a power reserve of 72 hours. The movement operates at 28,800bmp and can be adjusted to be very accurate. I saw a movement at the manufacture that was adjusted to operate within less than one second of deviation a day. I love that the movement combines modern technology and traditionalism. Like I said, it uses a free-weighted balance spring and column wheel, enjoys helps from highly sophisticated machinery in its assembly and manufacture. The Nicolas Rieussec watch case is 43mm wide and 14.8mm tall. It isn’t a small watch, but it does wear like a medium one. Its height is visually reduced by the highly curved lugs. Front and rear crystal are sapphire (with the front crystal having double AR coating), while it is water resistant to 30 meters. Montblanc has assured me that their dedication to the Nicolas Rieussec collection is intense. The collection will receive more attention in the future, which is aided by the fact that the watch is a marketing success. One of the reasons for this is the pricing. While the watches aren’t cheap they are more reasonable that you’d expect. The pieces come in gold, platinum, and steel. The gold models are in the $30,000 range. Not cheap, but Montblanc isn’t asking for $50,000. Actually, their platinum version is about $50,000 – which in the luxury market isn’t that much for a platinum watch. In steel the watch retails for about $9,200. It comes in a steel bracelet or an alligator strap (black or brown). I am told that soon Montblanc will develop a brand new metal bracelet for the Nicolas Rieussec collection. Overall these are enjoyable watches. The Montblanc identity is a major positive, and I enjoy the visual design and functionality of the R200 movement. While unique in its looks, this is an easy watch to wear daily. Montblanc isn’t making a mere collector’s piece here. Designed to prevent boredom but maintain utility the Nicolas Rieussec watch collection is intended for all types of watch lovers to worn daily.